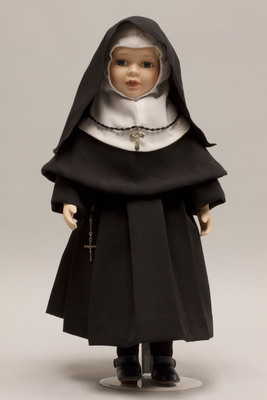 "Doll wearing habit worn by Sisters of Saint Agnes"
Porcelain doll is wearing a habit typical of the Sisters of Saint Agnes, an order founded in Barton, Wisconsin in 1858 by Father Caspar Rehri, an Austrian missionary. The habit is black with a white wimple, black veil, and white collar. The doll is wearing a black rosary around her neck and a metal crucifix hangs from her waist.